In a new series about the international community at SUSTech, we put a call out to our international students. István Zsombó, a Hungarian freshman, was one of the first students to respond to us. 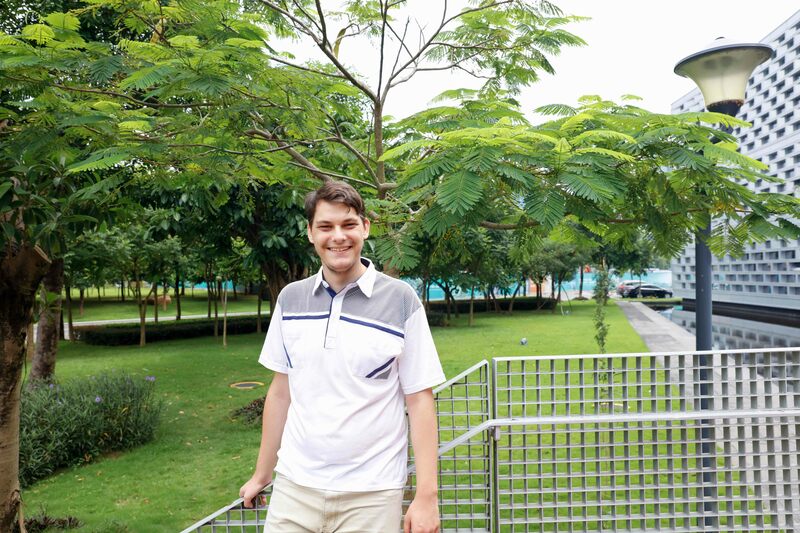 He joined SUSTech in 2018 from a famous Hungarian high school, and the Newshub sat down with him early in the 2018 academic year to find out more about him. Steve, as he prefers to go by, spent his primary school years in northern Hungary in the town of Salgótarján, an area that shares a border with Slovakia. Having shown his clear educational talents at a young age, he took the nearly 400-kilometer trip to Pécs, in the south of Hungary and close to the border with Croatia. It was there where Steve commenced his 5-year high school education at the prestigious Leőwey Klára Gimnázium, known in English as the Leowey Klara Grammar School. As a young student, Steve was an excellent pianist but developed an interest in mathematics from a young age. While in high school, he competed in numerous competitions, including the Arany Dániel or the national final of the national mathematics competition. During his high school years, he received excellent results in mathematics, physics and computer programming competitions, so it was no surprise to any of his instructors when he excelled in his final scores, with all scores above 90%, and both his mathematics and informatics scores surpassing 96%. Steve was brutally honest about his thought process. When he was looking at universities, he was looking for foreign universities that would teach in English and employ faculty with overseas experience. Encouraged by another Hungarian SUSTech student, Eszter, he took the challenge and decided to apply. “It’s just unbelievable. You can see how much resources and energy is put into SUSTech, and every day I am surprised by something.” He commented on how everyone is so friendly, whether it’s the students or the professors. He is always finding a pleasant surprise somewhere on campus every day, and he is enjoying every moment at SUSTech. When he told one of his teachers in high school that he was coming to Shenzhen, the teacher laughed at him, questioning whether Shenzhen even had a university. It appeared that the instructor had last been in Shenzhen 30 years earlier, showing how fast Shenzhen has developed in that time. While he hasn’t declared a major yet, he is interested in both mathematics and computer science. Steve is taking many general education courses and he highly appreciates the opportunities of the educational model. “The fact that I have the opportunity to choose between the two in the future, or potentially do both, is great,” Steve said, reflecting on his love for both subjects. Given the uncertainty he is experiencing now, he is enjoying the different courses he is undertaking at the moment. In terms of his everyday life, he hasn’t spent much time outside campus, because he can find pretty much everything he needs here. He has made friends here, and on occasion goes out to explore the city. Steve pointed out that his university experience is vastly different from his time in his high school, when he was with the same class of people, in the same room, for five years. While many Chinese students would sympathize with that, given their middle school and high school experiences, it still takes time to adjust to the different situations. When we asked him about the challenges he was facing, he first talked about the humidity, something that this writer nodded with agreement on. He also talked about how fast Shenzhen was developing, something that he didn’t realize when he left Hungary, and how friendly everybody was. Steve also talked about the financial differences. He was happy to have received a scholarship to SUSTech, given the traditional cost associated with traveling overseas to study. Steve also spoke about how important it was for his family and his community to be accepted into SUSTech. While Chinese food seems ubiquitous to many people, for some it takes time to adjust to Chinese cuisine and cutlery. Steve admitted that it took him a couple of days to work out how to use chopsticks. He also misses Hungarian food and finds Chinese food very different from what he was anticipating. However, he is enjoying the additional free time that he has available to study outside the classroom, and he wants to visit more of China, particularly larger cities like Beijing and Shanghai. Steve simply said that SUSTech is lovely. He reflected on his appearance in the Dunántúi Napló newspaper / magazine and their online portal, following his successful application to SUSTech. Some of his younger classmates have asked him about his time here so far, and he has told them that everything is lovely.